Honestly, I only read this book because I was a little murky on what consulting even is. I felt there was a piece of the puzzle that I must be missing and The MECE Muse by Christie Lindor seemed to be a book where I could find out everything that I needed to know about consulting in one organized reading. At least that’s what the subtitle implied: 100+ selected practices, unwritten rules, and habits of great consultants. This is one of those rare occasions where you get exactly what the book cover says you will. I learned everything that I need to know about consulting and, if you want to know more about this form of work, I can’t think of a better place to start than with this book. The first thing any book must be that is going to teach us something is well organized. This is a huge area and there is a lot to learn. Christie Lindor does a great job of breaking this intimidating subject down into easily managed parts that can be absorbed much easier than the whole topic. That’s because she does such a great job of breaking the subject down. If you want instant proof of this, just look at the table of contents. Once things are organized, you must have good writing to make your points effectively and, again, this is an area where Christie Lindor excels. The writing is great. It fits the tone of the subject matter and author attitude perfectly. I don’t know why you are considering buying this book, but all I can tell you is that if you buy it, it is money well spent. 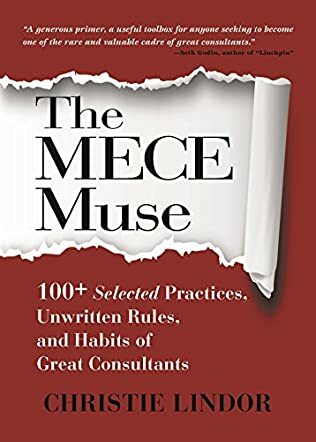 The MECE Muse: 100+ Selected Practices, Unwritten Rules, and Habits of Great Consultants by Christie Lindor is a useful tool that provides an insider’s view on consulting, career strategies, and unique perspectives on building and maintaining a successful consulting career. The book has interviews from top industry consulting leaders who relate their personal experiences that will give valuable insights and practical knowledge to readers. The author’s lessons learned and hard-earned wisdom - that spans over her fifteen-year career working for some top consulting firms and advising private and public sector clients - will help readers find what they are getting themselves into. The author handles the topic methodically and her top five insights about the consulting profession will help many readers to succeed in their consulting. The book also discusses career successes and failures, and helps to focus on maximizing career opportunities as a consultant before anyone can begin their career or walk on their journey of consulting greatness. The tips and techniques are simple and can be practiced easily. The MECE (Mutually Exclusive and Collectively Exhaustive) rule gives a technique on how business problems are visualized and understood so that the root cause of the problem can be solved. The exhaustive details provided by the author on many concepts help readers to dive into the strategies and topics covered. It is a good book to have in a personal collection as it can be used as refererence again and again on consulting suggestions and tips. The MECE Muse is very well-written and tackles all of the points in a clear and effective manner. Although at first glance, the book seems long, it is actually an easy read because of the layout and straightforward language that takes readers through all of the points. I liked that the book focuses on a very important aspect of business: to be very successful in consulting, or any business or career for that matter, being able to connect with all types of people, and being friendly yet professional is crucial. This book highlights the importance of this trait and Christie presents it well, while drawing upon her experience as a consultant. In The MECE Muse, author Christie Lindor offers insightful advice for consultants who are either just starting out or who have reached a certain point in their lives and are looking for a mentor figure. Christie Lindor offers to be the mentor she wished she had had, and gives step by step advice and information using a holistic lens. MECE (pronounced MEE-SEE) stands for "mutually exclusive, collectively exhaustive" and Lindor pushes it as the key principle in management consulting that turns mediocre Point-of-Sale consultants into great consultants who offer long term advice and operate with integrity. While providing an insider's guide to consulting, The MECE Muse by Christie Lindor also offers interviews with top consultants from several firms. In sharing their stories, they provide insight on what it takes to be among the greats. The MECE Muse by Christie Lindor is a well written and informative text. It is written in a way that makes for easy consumption and provides a great range of insights so that consultants of all levels will walk away with an enriched experience. By sharing her own personal journey, Lindor shows that there is no one way to be a consultant and she busts myths that may hold people back and limit their growth. In an exhaustive text, Lindor leaves no stone unturned, but the common thread throughout is that the consultants who go far and last longest are the ones who treat their team and their clients with respect, confidence, and knowledge. With a great resource in the back for further reading, The MECE Muse by Christie Lindor offers gems on all aspects of life. The MECE Muse by Christie Lindor is a non-fiction book that contains invaluable advice with regard to the world of consultancy. Lindor specifically writes about best practices, habits, and guidelines to observe in order to attain success as a consultant. The book is holistic and brilliantly researched, containing topics that explore the historical background of the profession, effective communication, successful personal branding, achieving work-life balance as a consultant, and relationship building, among other indispensable topics that are important in all spheres of consultancy. Overall, every chapter contained in The MECE Muse contains important takeaways that will widen any consultant’s perspective of what consultancy truly is. With more than fifteen years of experience in consultancy, Christie Lindor casts a unique light on this same discipline. Her perspective is distinctive from other books in the same field in that she takes a different approach. Beyond the technical bit, she delves into the less obvious and some of the most overlooked but vital aspects of consultancy. I loved her perspective which was noteworthy, especially with regard to what really makes a great consultant and the myths surrounding this question. Another area that was really enlightening for me was the connection between consultancy and organizational politics and how best to handle the latter as a consultant. The addition of Christie Lindor and other consultants’ experiences was also a plus for me as it added to the practicality of the guidelines and advice contained in The MECE Muse. This book is a must-read for all consultants or anyone considering a career in consultancy.